Black terrier has been raised at the farm "Red Star" by a reproductive crossbreeding of proved, well matching and complementing each other stud breeds: riesenschnauzer, airedaleterrier, rottweiler and Moscow Water Dogs. 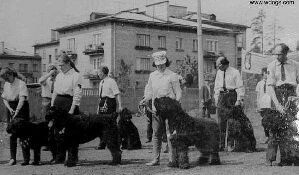 Moscow water Dog was produced only in the Red Star kennels, crossing Caucasian Ovcharka, Newfoundland and German Shepherd. The work involved a strict selection of dogs a desired type. - rottweiler females: Ouda (59UOY),Ouna (58UOY), Femka (7OU5OP), Ourma (73UOY). In 1952 - 1954 a considerable quantity of the first generation broods were obtained. After the dogs were raised, they were tested for working qualities and the best dogs were chosen for futher breeding. Beginning with the third generation the work was carried out to improve the breed. In the first group of this generation the best dogs was the sire Khaitar (86U9x), born in 1952 by riesenschnauzer Roy and airedaleterrier Sotta. It was a large male with a strong physique, a strong skeleton, a nice riesenschnauzer type head with dark eyes and healthy strong teeth. It had a well developed torso, a moderately wide and deep chest. The height in the withers was 63 cm, the weight was 32 kg. For exterior and working qualities he got exellent marks. 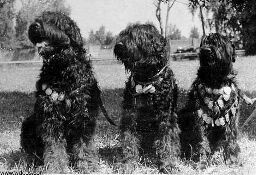 The second group of specimen was obtained from riesenschnauzer Roy and rottweiler Ouna who gave birth to two brothers Azart and Vakh in 1956. They were characterized by a coarce strong build, a massive skeleton, well developed muscles, a broad and deep chest. They had good working qualities and met all the requirements of a universal military dog. Vakh was 70 cm high in the withers. In addition, males Arai (from Roy and Ourma), Chubarik and Ahul (from Roy and Ouda) were used for further breeding. In 1955 the broods of the first and second generations for the time were demonstrated at the Exhibition of Economic Achievement and recieving a high mark. The next stage of breeding work involved raising of crosses as such, perfecting working qualities by a strict choice and selection of the best dogs for subsequent mating. Then it was time for a mass transfer of the puppies to utility dog breeding clubs and other farms for raising and breeding. This breed has been recognized first in Finland then Sweden, Holland, Germany, USA and many other countries. Due to great interest black terrier shown in many countries and owing to absence of any requlations, the dog livestock is continually flowing abroad where the breed recieved the name "Black Russian Terrier"
Follow the following link for and interesting article.